Dealer stands on all 17s in this super game of Perfect Pairs. You may split any pair, and you can re-split up to 2 times, though you cannot re-split aces. A split hand which ends up as a 2-card 21 is not considered blackjack. You can double down on any cards, even after a split, but not on split aces. Insurance is available for those who think it is necessary, at a cost equal to fifty percent of your initial starting bet. You cannot surrender in this game. Bonus Perfect Pairs payouts are only available to players who make a side bet prior to the deal. 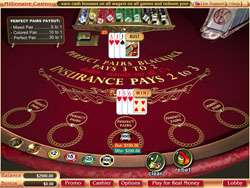 In Perfect Pairs Blackjack your initial bet must be somewhere between 2 and 200 USD/GPB/Euro. All wagers are made using chips in denominations of either 2, 5, 25, or 100. This game of Perfect Pairs Blackjack was built by Vegas Technology – that alone is enough to tell you that it is a superior game. The graphics are photo realistic, and the cards are bold and clear, and never hard to read. The chips are equally well rendered. The animated cards fly out of the shoe as if by magic, landing neatly on the table for you to work from. The buttons you need to use are all well-placed, and even these look good. There is absolutely nothing in this game that gets in the way of your blackjack experience! Perfect Pairs side bets are tricky things. They can pay out big, but like all big payouts, the odds are low. The lowest payout, however, gives you 5:1 payout for just getting dealt a pair. This actually happens pretty often, so if you’re willing to wager a bit on the side, it can definitely pay off! Especially on those rarer occasions when you get Colored or even Suited pairs! There are not many games in the world that can beat a heated round of Perfect Pairs. When you pack that kind of classic gameplay into a graphically smashing package like this one, you get a real treat for the senses. This game will satisfy the strongest thirst for winning, while at the same time providing a Vegas-like experience right in your own home. What are you waiting for, download it today!